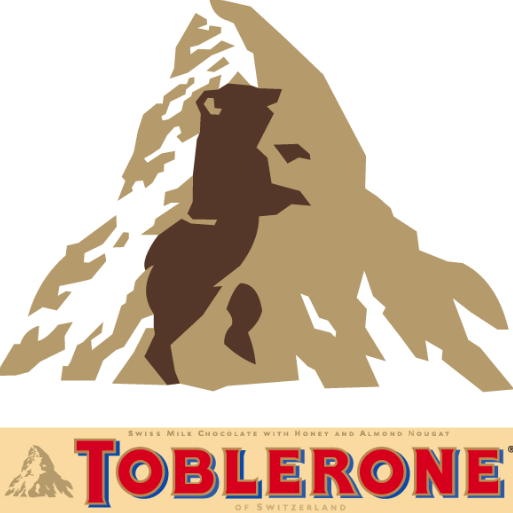 TRUTH REVEALED: The Secret Behind Toblerone Logo That Every Chocolate Lover Should Know! Everyone loves chocolate. Eating these ultimate comfort food will help us relieve stress and improve our moods, especially to those who are in love. One of the famous chocolate brand in the world is Toblerone. The brand's distinctive triangular shape makes it very familiar and identifiable compared to other known chocolate brands. Aside from that, its unique flavor will surely identify each chocolate lover the taste of a Toblerone chocolate as to another. Its packing and taste mark us, consumers, that Toblerone is a well-established when it comes to chocolate production and distribution worldwide. But do you know that there is something that is not really revealed in the brand's logo? Take a look on the enlarged photo of Toblerone. It is like a normal mountain which represents the Mount Matterhorn in the Alps, where the brand's origin, Switzerland, is found. If you are going to look closer, you will see a hidden image of a bear. This was not an accident, but the logo it made it just right! What does the bear mean? The bear is Bern's (Swiss capital) mascot and also known as "city of bears". Sounds interesting right? Well, knowing and appreciating more about the product's history will be much more fun and exciting, with every chocolate bite and happiness it gives to everyone.